The use of invasive monitoring technologies and aggressive hemodynamic resuscitation protocols has increased. Therefore, the ability to gain rapid and accurate vascular access has become a skill that it is imperative for critical and emergency care physicians to possess. Peripheral veins can be used to gain access to the central venous system. However, this requires the placement of long catheters via superficial veins that may be difficult to locate in emergency situations. The predictable anatomic locations of the internal jugular, subclavian, and femoral veins make them easy to cannulate in patients who are critically ill.
One of the most common methods for gaining central venous access in emergency situations is via femoral vein cannulation. The technique of accurately placing a femoral vein catheter depends on appropriate patient selection and a sound knowledge of anatomy. As with most other central venous cannulations, the modified Seldinger technique is used. For more information on subclavian vein cannulation, see Central Venous Access, Subclavian Vein, Subclavian Approach and Central Venous Access, Subclavian Vein, Supraclavicular Approach. The femoral vein lies within the femoral triangle in the inguinal-femoral area (see the image below). The superior border of the triangle is formed by the inguinal ligament, the medial border by the adductor longus, and the lateral border by the sartorius. The apex of the triangle is formed by the sartorius crossing the adductor longus. The roof of the triangle is composed of the skin, subcutaneous tissue, the cribriform fascia, and the fascia lata. The concave floor is formed by the underlying adductor longus, adductor brevis, pectineus, and iliopsoas. The neurovascular bundle consists of the femoral vein, artery, and nerve, which lie within the triangle in that order from medial to lateral. The femoral sheath encloses the femoral artery and vein, and the nerve lies outside the sheath. The femoral canal is a space within the femoral sheath and medial to the femoral vein. The femoral artery lies at the midinguinal point, which is midway between the pubic symphysis and the anterior superior iliac spine. 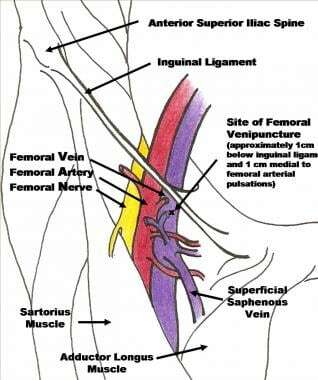 The surface anatomy of the femoral vein is identified for venipuncture by palpating the point of maximal pulsation of the femoral artery immediately below the level of the inguinal ligament and marking a point approximately 0.5 cm medial to this pulsation. Many clinical situations necessitate placement of central venous catheters. The choice of site is dictated by the specific advantages and disadvantages of each access method in the clinical situation being considered. The femoral site is advantageous in patients who are critically ill because the femoral area is relatively free of other monitoring and airway access devices. If a bedridden patient requires central venous access, the femoral site allows relatively free movement of arms and neck without impeding the access line. In patients with severe coagulopathy or profound respiratory failure, femoral access precludes the risks of a development of a hemothorax or pneumothorax, both of which are potential complications of supraclavicular venous access. For more information about the relevant anatomy, see Femoral Sheath and Inguinal Canal Anatomy and Arterial Supply Anatomy. Marik PE, Flemmer M, Harrison W. The risk of catheter-related bloodstream infection with femoral venous catheters as compared to subclavian and internal jugular venous catheters: a systematic review of the literature and meta-analysis. Crit Care Med. 2012 Aug. 40 (8):2479-85. [Medline]. [Guideline] American Society of Anesthesiologists Task Force on Central Venous Access., Rupp SM, Apfelbaum JL, Blitt C, Caplan RA, Connis RT, et al. Practice guidelines for central venous access: a report by the American Society of Anesthesiologists Task Force on Central Venous Access. Anesthesiology. 2012 Mar. 116 (3):539-73. [Medline]. [Guideline] Bodenham Chair A, Babu S, Bennett J, Binks R, Fee P, Fox B, et al. Association of Anaesthetists of Great Britain and Ireland: Safe vascular access 2016. Anaesthesia. 2016 May. 71 (5):573-85. [Medline]. [Full Text]. Pikwer A, Sterner G, Acosta S. Inadvertent arterial catheterization complicating femoral venous access for haemodialysis. Scand J Urol Nephrol. 2012 Apr. 46 (2):156-60. [Medline]. Parienti JJ, Thirion M, Mégarbane B, Souweine B, Ouchikhe A, Polito A, et al. Femoral vs jugular venous catheterization and risk of nosocomial events in adults requiring acute renal replacement therapy: a randomized controlled trial. JAMA. 2008 May 28. 299 (20):2413-22. [Medline]. Gallieni M, Pittiruti M, Biffi R. Vascular access in oncology patients. CA Cancer J Clin. 2008 Nov-Dec. 58(6):323-46. [Medline]. Deshpande KS, Hatem C, Ulrich HL, Currie BP, Aldrich TK, Bryan-Brown CW, et al. The incidence of infectious complications of central venous catheters at the subclavian, internal jugular, and femoral sites in an intensive care unit population. Crit Care Med. 2005 Jan. 33 (1):13-20; discussion 234-5. [Medline]. Moraco AH, Kopec SE. Central venous catheters. Irwin RS, Lilly CM, Mayo PH, Rippe JM, eds. Irwin & Rippe's Intensive Care Medicine. 8th ed. Philadelphia: Wolters Kluwer; 2018. 36-49. SELDINGER SI. Catheter replacement of the needle in percutaneous arteriography; a new technique. Acta Radiol. 1953 May. 39 (5):368-76. [Medline]. Marino PL. Central venous access. Marino's The ICU Book. 4th ed. Philadelphia: Wolters Kluwer; 2014. 17-40. Hoffman T, Du Plessis M, Prekupec MP, Gielecki J, Zurada A, Shane Tubbs R, et al. Ultrasound-guided central venous catheterization: A review of the relevant anatomy, technique, complications, and anatomical variations. Clin Anat. 2017 Mar. 30 (2):237-250. [Medline]. Brass P, Hellmich M, Kolodziej L, Schick G, Smith AF. Ultrasound guidance versus anatomical landmarks for subclavian or femoral vein catheterization. Cochrane Database Syst Rev. 2015 Jan 9. 1:CD011447. [Medline]. Horowitz R, Gossett JG, Bailitz J, Wax D, Pierce MC. The FLUSH study--flush the line and ultrasound the heart: ultrasonographic confirmation of central femoral venous line placement. Ann Emerg Med. 2014 Jun. 63 (6):678-83. [Medline]. Abboud PA, Kendall JL. Ultrasound guidance for vascular access. Emerg Med Clin North Am. 2004 Aug. 22 (3):749-73. [Medline]. Karapinar B, Cura A. Complications of central venous catheterization in critically ill children. Pediatr Int. 2007 Oct. 49 (5):593-9. [Medline]. Eisen LA, Narasimhan M, Berger JS, Mayo PH, Rosen MJ, Schneider RF. Mechanical complications of central venous catheters. J Intensive Care Med. 2006 Jan-Feb. 21 (1):40-6. [Medline]. [Full Text]. Sirvent AE, Enríquez R, Millán I, García-Marco JM, Rodríguez-Czaplicki E, Redondo-Pachón MD, et al. Severe hemorrhage because of delayed iliac vein rupture after dialysis catheter placement: is it preventable?. Hemodial Int. 2012 Apr. 16 (2):315-9. [Medline]. Warkentine FH, Clyde Pierce M, Lorenz D, Kim IK. The anatomic relationship of femoral vein to femoral artery in euvolemic pediatric patients by ultrasonography: implications for pediatric femoral central venous access. Acad Emerg Med. 2008 May. 15 (5):426-30. [Medline]. The authors and editors of Medscape Drugs & Diseases gratefully acknowledge the assistance of Lars Grimm, MD, MHS, with the literature review and referencing of this article.